On Friday, we examined the best hockey hugs of the past two weeks. Today, we aim a little higher. These are the top 10 hockey hugs of the past 12 months. 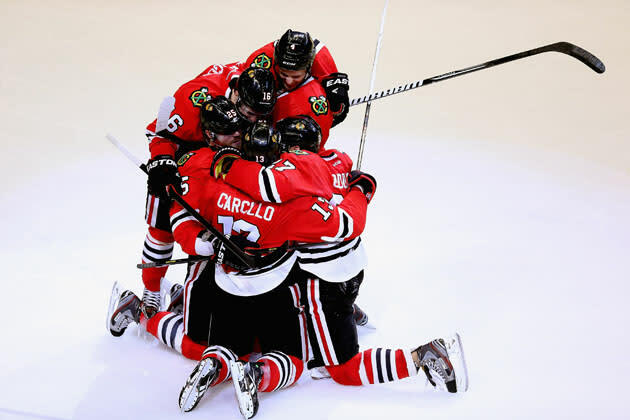 Eventually, Chicago grew so weary of celebrating goals the normal way that they began choreographing ice dance routines like the one you see above. This was a beautiful lift, but the double twist that followed it was really sublime. It was a professional level twist, you guys. 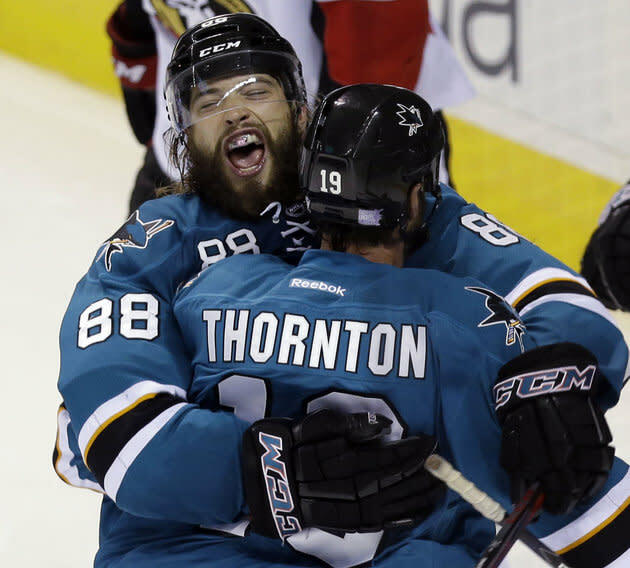 Late one night, after a game, Brent Burns was attacked by a werewolf. The doctors were able to spare his life, but he was forever changed, and now, under the light of a full moon, he becomes a thing that is half man and half beast. When this happens, the only thing the Sharks can do is hold onto him in the hopes of containing him until he reverts to his original form, lest he eat an opponent. He struggles and screams. More often than not, this job falls to Joe Thornton, because that's just one of the responsibilities of being a captain, like dealing with the media. It's Francois Beauchemin's eyes. 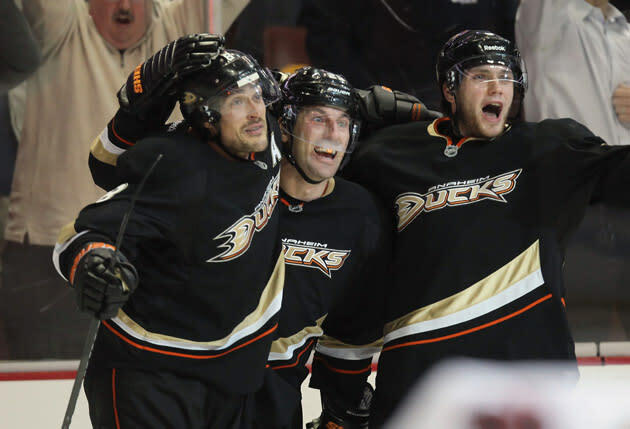 Teemu Selanne and Bobby Ryan look like guys that just scored. Beauchemin looks like a guy that just scored acid. Another ice dance routine from the reigning Stanley Cup champions. 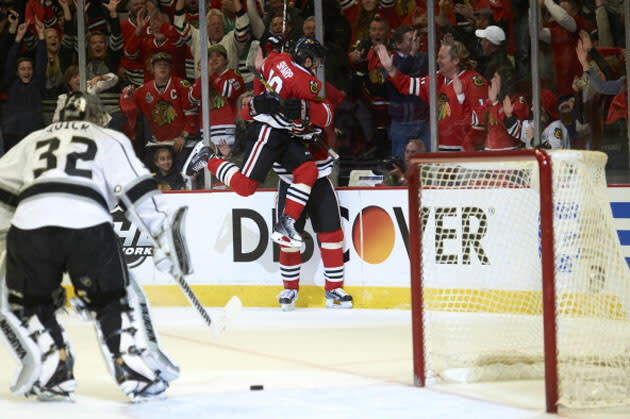 In this one, Patrick Kane and Marian Hossa show off their incredible chemistry. I like the guy recording the moment for posterity on his camera phone just above them. I'm sure the composition on that one rivals this one. Not to be outdone by Francois Beauchemin's crazy eyes, here's Corey Perry seeing straight into heaven. Either that or he just really, really likes hugging Ryan Getzlaf. "Oh, hey, Andrej Meszaros. We just scored a goal. Me and David here. Did you see it? That's why we're hugging. It's pretty fun." There are two hockey hugs going on in this photo. There's the one between Tyler Bozak and Joffrey Lupul, and there's the one between the two fans behind them. But it's pretty clear which one is better: the one that Carlton the Bear desperately wants in on. Look at him back there, pining pantslessly in his glass case of emotion. Poor guy. He may be expressionless, but it's clear he has so much to express. 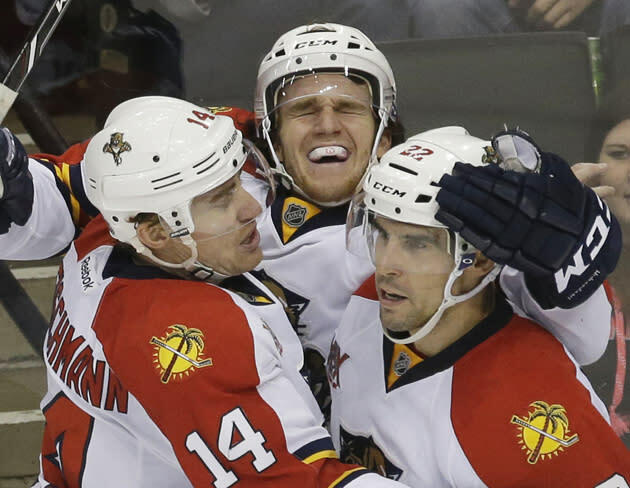 Before I die, I want to experience whatever Jonathan Huberdeau is experiencing here. Preferably in private. It's like a hockey hug directed by Stanley Kubrick. You're not sure where to look, and you can't escape the suspicion that everything in the frame -- literally everything -- was carefully considered and imbued with meaning. You could make a documentary about this hug that's just a bunch of crazy people reading too much into it. 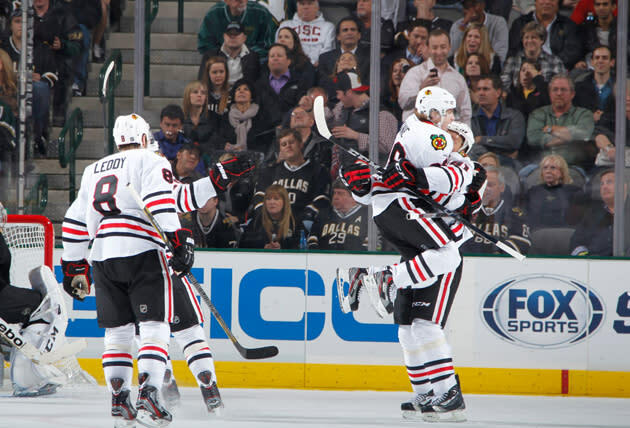 But in the end, nothing will top the Blackhawks' "Like a Prayer" hockey hug. It was the best of the 2012-13 season and nothing in the first three months of this year has even come close. Here's hoping 2014 delivers a hug half as good as this.